What is dimensional weight of cargo and why is it important? 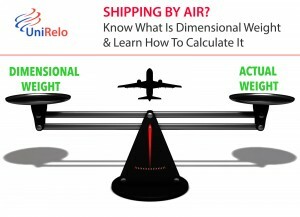 Home » Blog » What is dimensional weight of cargo and why is it important? Have you wondered why most airlines have restrictions on both the size & weight of your check-in baggage and also on cargo shipped as unaccompanied baggage? Do you know how airlines evaluate the weight of your cargo when charging you for excess weight or when charging you for cargo shipped as unaccompanied baggage? Cargo space has physical limits based on the volume of the cargo and the weight. The reason why both volume & weight are evaluated can be better understood if you consider the cost of shipping a large object with less weight. For example, a large box containing styrofoam cups weighs very less, i.e., the dimensional (volume) weight of that box will likely be more than its actual weight. It is for this reason that most airlines and other transport providers evaluate both dimensional weight & actual weight, and then use the greater of the two weights to bill you for the transportation costs. The greater of the two weights is also commonly referred to as ‘chargeable weight’. So let’s look at a couple of illustrations to better understand the concept of ‘Dimensional Weight’ and learn how to calculate it. Example 1: A box containing clothes weighs 25 LBS. It measures 18”x18”x24”. Step 2: Divide the cubic inches by 166 to obtain dimensional weight. Transportation costs would be billed based on the dimensional weight of 47 LBS. Example 2: A box containing books weighs 50 LBS. It measures 12”x12”x18”. Transportation costs would be billed based on the actual weight of 50 LBS. The formula for calculating the dimensional weight is 166 cubic inches per pound (6000 cubic centimeters per kilogram or 366 cubic inches per kilogram). First multiply the length by the width by the height to obtain the cubic inches or cubic centimeters. Then use the below formulas to get dimensional weight. To get dimensional weight in kilograms (kgs) from cubic inches, divide the cubic inch result by 366. To get dimensional weight in pounds (lbs) from cubic inches, divide the cubic inch result by 166. To get dimensional weight in kilograms (kgs) from cubic centimeters, divide the cubic centimeter result by 6000. *** Remember that when shipping your cargo as unaccompanied baggage your shipment may need to be packaged within containers such as crates or pallets and the dimensional weight and actual weight are evaluated for the crate(s) or pallet(s) as a whole, not based on individual boxes contained within those containers. Have more questions on dimensional weight? Feel free to call or email us and we’ll be happy to help!